Why is public space disappearing? Why is this disappearance important to democratic politics and how has it become an international phenomenon? Public spaces are no longer democratic spaces, but instead centres of private commerce and consumption, and even surveillance and police control. 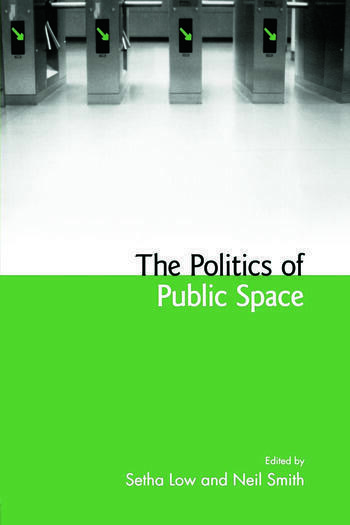 "The Politics of Public Space" extends the focus of current work on public space to include a consideration of the transnational - in the sense of moving people and transformations in the nation or state - to expand our definition of the 'public' and public space. Ultimately, public spaces are one of the last democratic forums for public dissent in a civil society. Without these significant central public spaces, individuals cannot directly participate in conflict resolution. "The Politics of Public Space" assembles a superb list of contributors to explore the important political dimensions of public space as a place where conflicts over cultural and political objectives become concrete. Setha Low is Professor of anthropology and environmental psychology at the CUNY Graduate Center. She is the author or editor of numerous books, including Theorizing the City (1999), On the Plaza (2000), Place Attachment (1992), Housing, Culture and Society (1989), Cultural Spaces (2001) and Behind the Gates (Routledge, 2003). Neil Smith is Distinguished Professor of Geography and Anthropology at the City University of New York Graduate Center and Director of CUNY's Center for Place, Culture, and Politics. He is the author of four major books; Uneven Development (1983 and 1991), The New Urban Frontier (Routledge, 1996), American Empire: Roosevelt's Geographer and the Prelude to Globalization (2003), which received The Los Angeles Times Book Award for biography in 2003 and the recently published Endgame of Globalization(Routledge, 2004). "This brisk and trenchant defense of the importance of a genuinely public urban realm could not be more timely." "What makes this edited collection especially valuable, indeed unusual, is its reliance on a wide range of intellectual approaches to public space, from the theoretical to the empirical. Public space today is simply too complicated for anything less, and this volume thankfully satisfies that demand."